So after the Gehrig Zipper back auction everything this past week seems to pale in comparison. The Tryon zipper back reached $650+ but failed to meet the reserve. 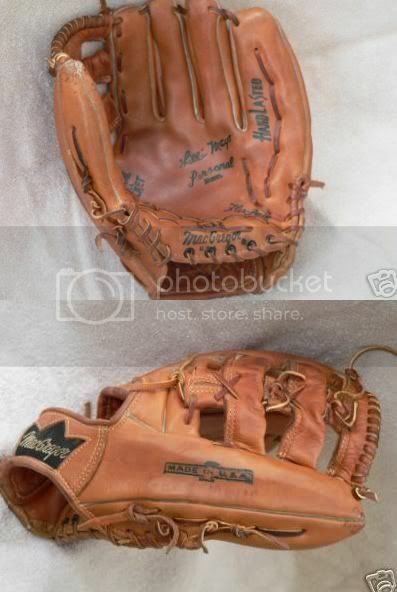 But for the glove of the week I'd like to suggest a MacGregor GC12 Willie Mays personal model. 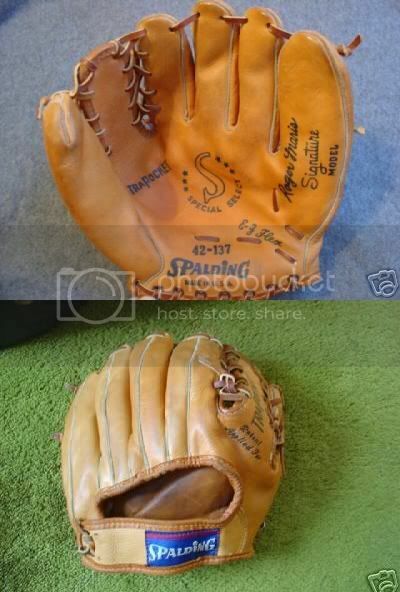 The glove is in near mint condition - light ink under the "Made in USA" stamp and some scuffing on the thumb. I think the glove is interesting, partially for what it is not...The glove sold for $356, compare this to a Mantle in similar condition. Better yet, assuming that the GC12 is the top Mays model out there, compare it to a Mantle XPG6 in similar condition. But that is always the case, Mantle is the king when it comes to Baseball collectibles, and as Brett's poll is showing, people love Rawlings gloves. Nonetheless, the Mays glove below is a real beauty. I like the deep stampings on MacGregor gloves, the crown patch, and the triple t-bar web also looks good. And now for something I don't understand...The Spalding Roger Maris pictured below sold for $215 this past week. OK, clearly the glove is mint and it endorsed by Maris, a sympathetic and now beloved figure in the game. But given how far $215 can go in this hobby (which is one of the best attributes of collecting gloves) I really can't figure this one out. The glove was the lowest quality Spalding glove made at the time. As a glove collector I don't think other glove attributes can make up for the quality of the glove to begin with. With all due respect to the buyer, the glove has many great attributes otherwise, but it is not for me. I could not agree with you more on both gloves. That Mays was a really special glove, and earlier this year another one went for around $600, so go figure that! I personally would not have any interest in that Spalding, as you stated is was a very low grade glove. For $200 plus I think you could do a bit better. Just my .02 though.